Once again, it’s been awhile since I last posted. Let’s see if we can remedy that. First, let me catch you up on my life. I live in Hawai’i. I’m a substitute teacher. I love to sew. 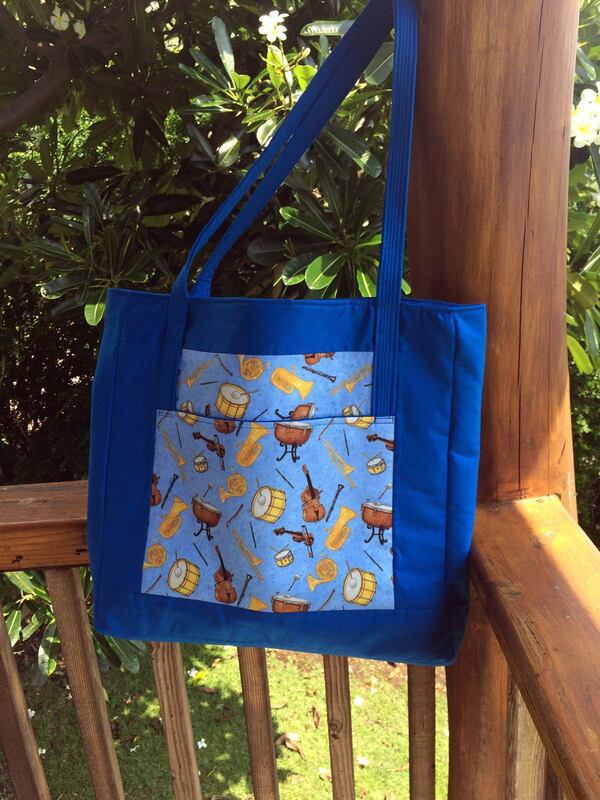 This Lanai Style of Kona Music Bag — “The Jazzy” really knows how to sing the blues. The bag measures 19″ x 19″ x 4″ and has one outside slip pocket, and one 12″ wide, 8″ deep inner zip pocket. These totes are huge. A couple of our local music teachers carry these. Gloria has had hers for over 2 years and it is still going strong. She regularly carries 20 pounds of music and student files in it, and takes the bag everywhere she goes. Nice! I have not sewn anything in a long while but have a pillow or two I want to make. I’m having a blast with my sewing. I see you have having a blast with your grandchild. Your pastime has the greatest lasting value. Lovely to see you back again. I love your tote bag, brilliant. When did you move to Hawaii? Sounds gorgeous. Another place I have not visited. YET!! !